Revenue in the Household Appliances segment amounts to US$86,811m in 2019. Revenue is expected to show an annual growth rate (CAGR 2019-2023) of 8.5%, resulting in a market volume of US$120,235m by 2023. User penetration is 15.4% in 2019 and is expected to hit 23.2% by 2023. The average revenue per user (ARPU) currently amounts to US$76.56. In global comparison, most revenue is generated in China (US$29,183m in 2019). The eCommerce market segment Household Appliances covers online sales of long-lived electronic home appliances. These are, for example, major domestic appliances white goods such as washing machines, dishwashers, refrigerators, or washer-dryers. Furthermore, the online sale of small domestic appliances such as coffee machines, espresso machines, food processors, microwaves and vacuum cleaners belong to this market segment. Electronic home appliances can be purchased via a variety of online platforms, including internet retailers (amazon.com), furniture stores (ikea.com) or from electronic retailers (bestbuy.com). All monetary figures refer to the annual gross revenue and do not factor in shipping costs. Reading Support Revenue in the Household Appliances segment amounts to US$86,811m in 2019. Reading Support The Household Appliances segment is expected to show a revenue growth of 11.3% in 2020. Reading Support In the Household Appliances segment, the number of users is expected to amount to 1,777.4m by 2023. 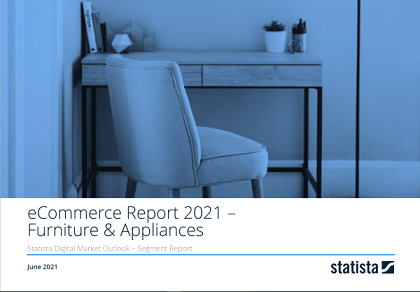 Reading Support User penetration in the Household Appliances segment is at 15.4% in 2019. Reading Support In the year 2017 a share of 35.0% of users is 25-34 years old. Reading Support In the year 2017 a share of 54.7% of users is male. Reading Support In the year 2017 a share of 40.9% of users is in the high income group. Reading Support With a market volume of US$29,183m in 2019, most revenue is generated in China. Reading Support With a rate of 38.7%, the user penetration in the Household Appliances segment is highest in Argentina.